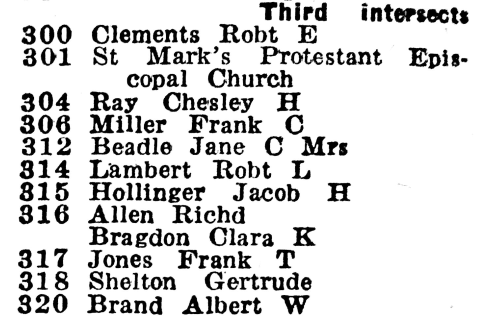 Washington Herald, 9 October 1922, p. 2. Lizzie E. Blood (clerk); Sarah Blood (widow of Horatio Blood). Elizabeth E. Blood (clerk); Sarah Blood (widow of Horatio Blood). 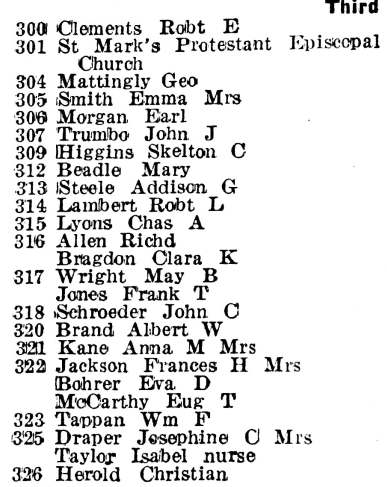 Elizabeth E. Blood (clerk); Sarah W. Blood. 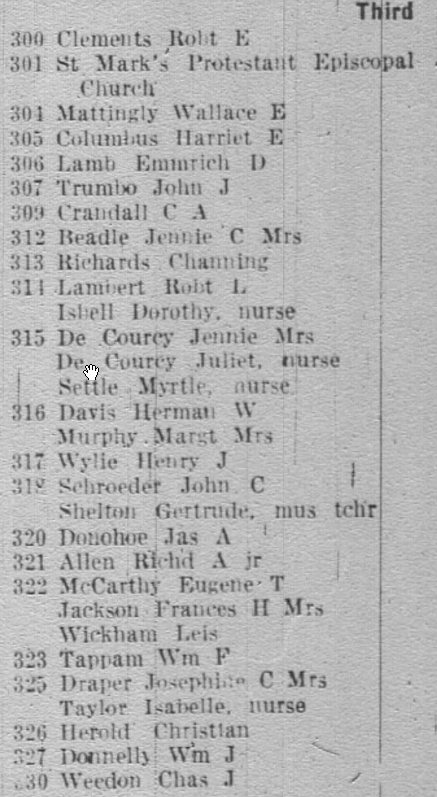 Elizabeth E. Blood (clerk); Sarah W. Blood (widow of Horatio Blood). Edgar DeS. Frasier (clerk, Census Bureau); Julius Fleishman (clerk, Census Bureau); James Cross (clerk). 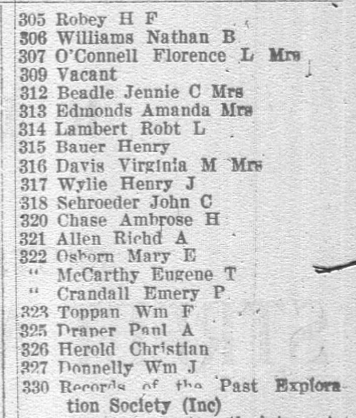 Thomas E. Morgan (A. W. Morgan & Son); C. G. Boyce (widow of William Boyce). Lena Johnson (servant); John W. Brown, clerk, Adjutant General’s Office). Stannie Howard (servant); Charles W. Tabler. Charles W. Tabler (clerk); J. Harry Tabler. Charles W. Tabler (clerk); J. Harry Tabler; John W. Fite (printer); George S. Donnell (stationery clerk, office of the Clerk of the House of Representatives); Ormsby B. Thomas (member of Congress). Rice W. Hooe (bailiff, Police Court); Rebecca Dangerfield. Rice W. Hooe (bailiff, Police Court); Josiah W. Shaw (clerk, Pension Office). Josiah W. Shaw (clerk); Josiah Shaw (clerk). Josiah W. Shaw (clerk, Pension Office); Josiah Shaw (clerk). Josiah W. Shaw (clerk, Pension Office). John B. Peyton (clerk); Lucien B. Peyton (clerk). 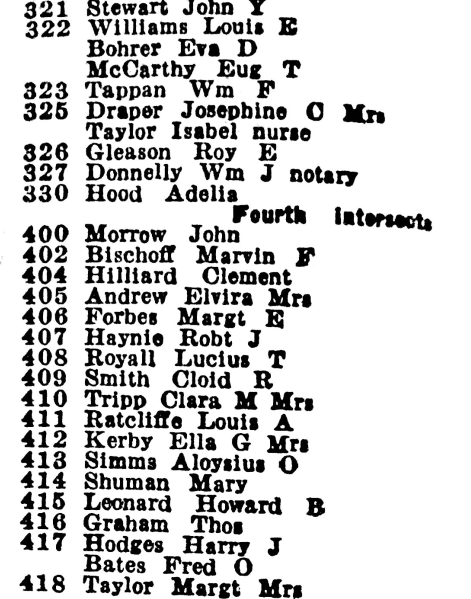 Clara V. Trow; Gordon W. Trow (notary). 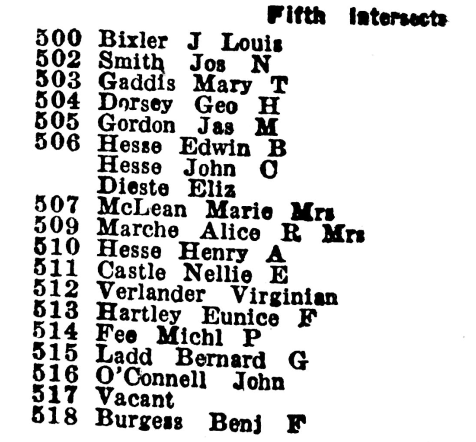 Clara V. Trow (teacher); Gordon W. Trow (clerk, District Commission). Earl R. Baxter (printer); Charles E. Capehart (messenger); Charles E. Steuven (watchman). William B. Hartley (W. B. Hartley & Son); William P. Hartley (W. B. Hartley & Son). William B. Hartley (W. B. Hartley & Son); William P. Hartley (W. B. Hartley & Son); John Hawkins (clerk); John Hawkins (clerk). W. B. Hartley (broker); William P. Hartley (clerk); John Hawkins (engineer). Eunice F. Hartley (Government Printing Office); Eunice Hawkins (widow of John Hawkins). 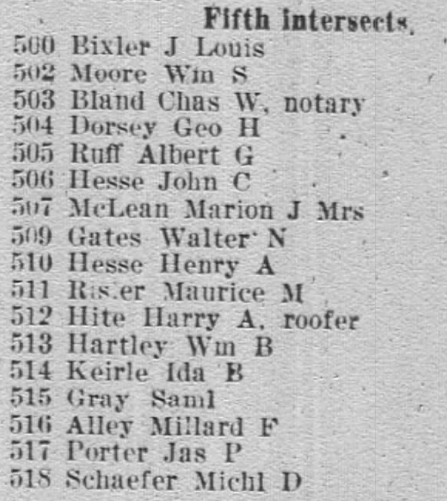 Eunice F. Hartley (Government Printing Office); William B. Hartley (merchandise broker and manufacturers’ agent); Eunice P. Hawkins (widow of John Hawkins). 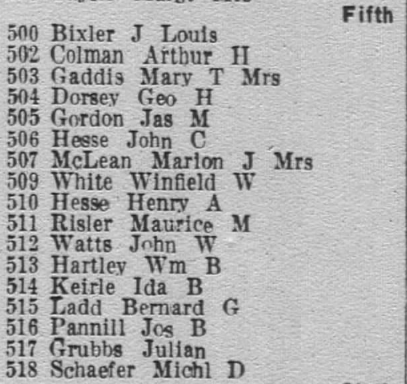 William B. Hartley (merchandise broker and manufacturers’ agent); William P. Hardley (advertising agent); Eunice E. Hawkins (widow of John Hawkins). William B. Hartley (merchandise broker and manufacturers’ agent); William P. Hartley (solicitor); Eunice F. Hartley (Government Printing Office). 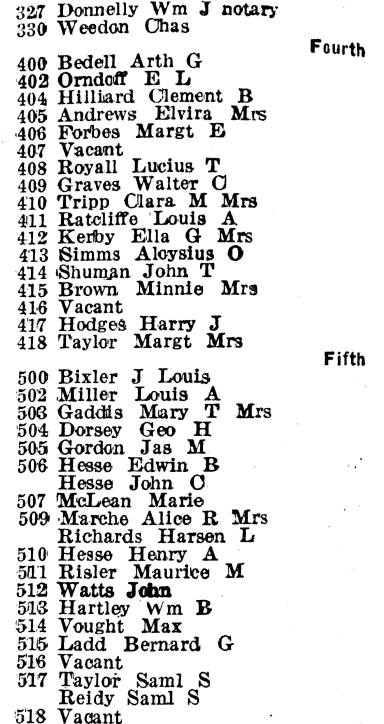 William P. Hartley (solicitor); Eunice E. Hawkins (widow of John Hawkins). Eunice E. Hawkins (widow of John Hawkins); Eunice F. Hartley (Government Printing Office); William B. Harley (merchandise broker and manufacturers’ agent). 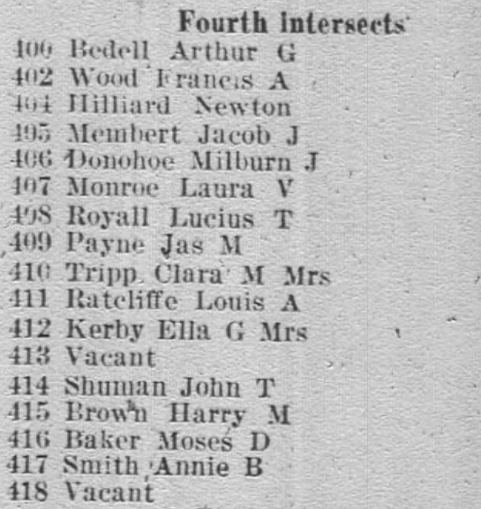 Emma F. Hartley (clerk); Eunice F. Hartley (Government Printing Office); Dorothea S. Hartley; William B. Hartley (merchandise broker and manufacturers; agent); Eunice E. Hawkins (widow of John Hawkins). 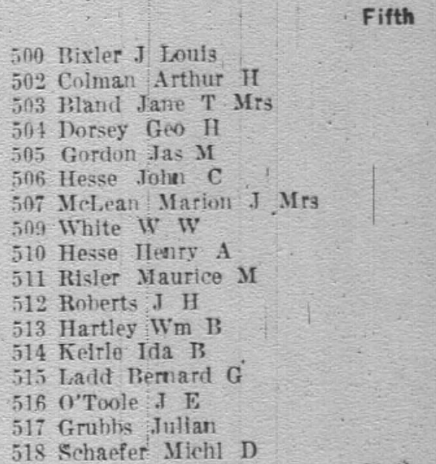 William B. Hartley; Eunice F. Hartley (Government Printing Office, boards); Eunice E. Hawkins (widow of John Hawkins, boards). Eunice F. Hartley (skilled laborer, Government Printing Office); Eunice E. Hawkins (widow of John Hawkins). Eunice F. Hartley (skilled laborer, Government Printing Office). William B. Hartley (merchandise broker). William B. Hartley (merchandise broker); Eunice F. Hartley (clerk, Government Printing Office); Eunice E. Hawkins (widow of John Hawkins); Julia Washington. Eunice F. Hartley (skilled laborer, Government Printing Office); Sara D. Hartley (clerk (Treasury Department). 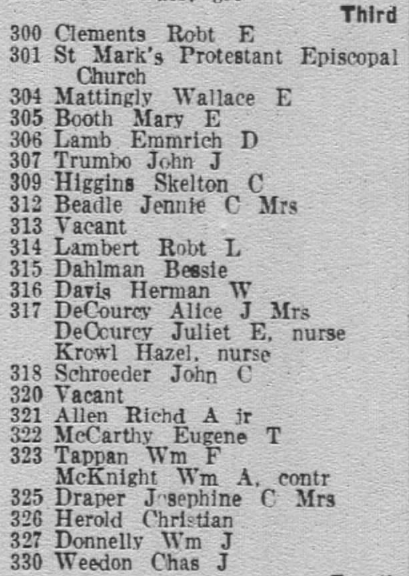 William B. Hartley; Eunice F. Hartley (helper, Government Printing Office); Eunice E. Hawkins (widow of John Hawkins). 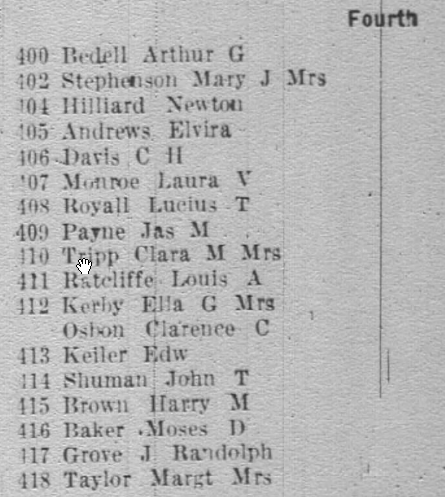 Federal census, 1900, 513 A St., SE, Washington, D.C.
William B. Hartley, head, b. August 1843, 56, married 34 years, b. in Del., father b. in Del., mother b. in Penn., commercial broker, owns home. Sarah Hartley, wife, b. June 1846, 53, married 34 years, mother 10 children (3 living), b. in D.C., parents b. in Va., no occupation. 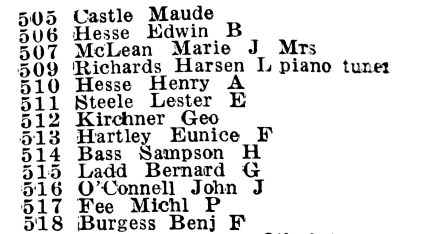 Unice [sic] Hartley, daughter, b. Oct. 1877, 22, single, b. in D.C., father b. in Del., mother b. in D.C., typewriter. S. Dorothea Hartley, daughter, b. Feb. 1888, 12, b. in D.C., father b. in Del., mother b. in D.C., at school. 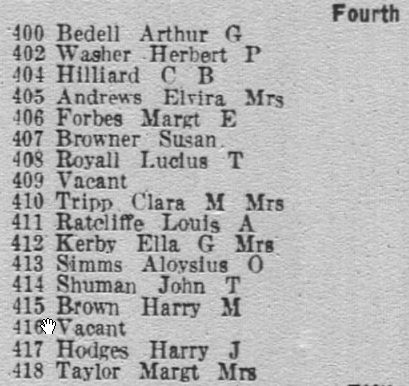 Federal census, 1920, 513 A St., SE, Washington, D.C.
William B. Hartley, head, owns home, 76, married, b. in Del., father b. in Del., mother b. in Penn., broker, merchandise. Sarah Hartley, wife, 73, married, b. in D.C., parents b. in Va., no occupation. Eunice F. Hartley, daughter, 41, single, b. in D.C., father b. in Del., mother b. in D.C., clerk, U.S. Printing Office. Sarah Dorothea Hartley, daughter, 31, single, b. in D.C., father b. in Del., mother b. in D.C., clerk, U.S. War Department. Eunice E. Hawkins, sister-in-law, 71, widow, b. in D.C., parents b. in Va., no occupation. 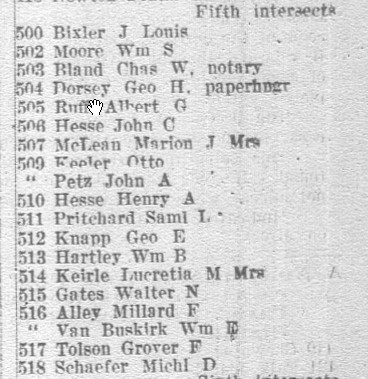 Federal census, 1910, 513 A St., SE, Washington, D.C.
William B. Hartley, head, 66, married (once) for 44 years, b. in Del., father b. in Del., mother b. in Penn., broker, merchandise. Sarah M. Hartley, wife, 68, married (once) for 44 years, b. in D.C., parents b. in Va., no occupation. William P. Hartley, son, 37, divorced, b. in D.C., father b. in D.C., mother b. in Del. [sic], agent, advertising. Sarah D. Hartley, daughter, 22, single, b. in D.C., father b. in D.C., mother b. in Del., student, music. Eunice F. Hartley, daughter, 32, single, b. in D.C., father b. in D.C., mother b. in Del., sewer, bookbinding. Eunice S. Hawkins, sister-in-law, 61, widow, b. in D.C., parents b. in Va., no occupation (own income). 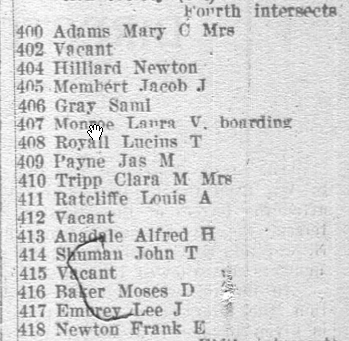 Federal census, 1940, 513 A St., SE, Washington, D.C.
Eunice F. Hartley (owns home, value $7,000), head, 62, single, completed high school, b. in D.C., lived in same house in 1935, clerk, U.S. Government Office, income $1,800. Sarah D. Hartley, sister, 52, single, completed 2 years of high school, b. in D.C., lived in same house in 1935, no occupation. 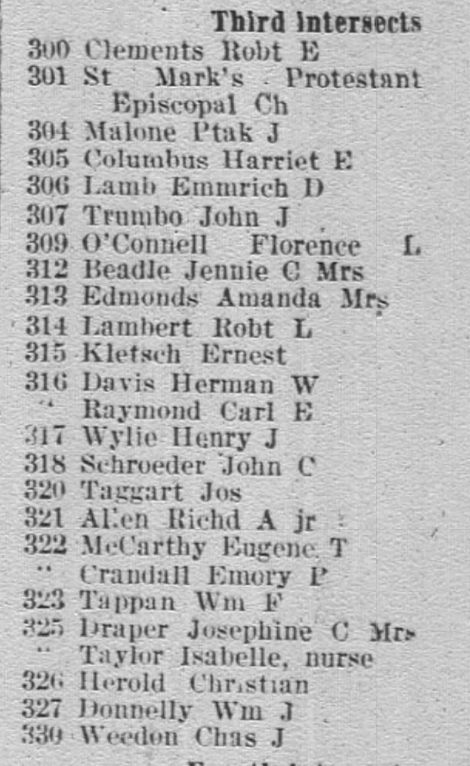 Washington Evening Star, 2 December 1916, p. 2.